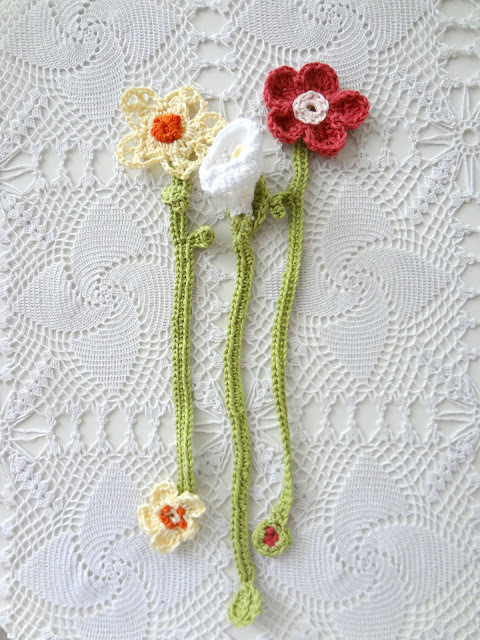 Here's a lovely project to tackle - crochet flower bookmarks. Don't need to say they make lovely gifts and you can put all your yarn lefties to a good use. Let's start. For the bookmarks I used sport yarn and 1.9 mm hook. You can use thicker yarn + adequate hook, but remember that in that case the size of these would be bigger. Rnd 1: Sc 9 in ring and sl st with 1st st - it will make 10. Rnd 2: Ch2, dc3, hdc1 in the first stith, sc 1 in the next. Repeat this pattern around. You will get 5 petals. Rnd 3: Over the 1st petal: ch2 +dc1 in the 1s st, dc2 in the 2nd, treble 2 in the 3rd, dc2 in the 4th and dc1+hdc1 in the last (5th) stitch. Sc between petals and repeat the petal pattern for the next petal. Ch 6 and join to make a ring. DC10 in ring. Join with a sl st to end. For the stem I chained 65 - used a standard A5 book format to measure it fits. Near the flower I made a leaf. Leaf pattern below. At the bottom I made a loop, turned it and made sl st the other way. 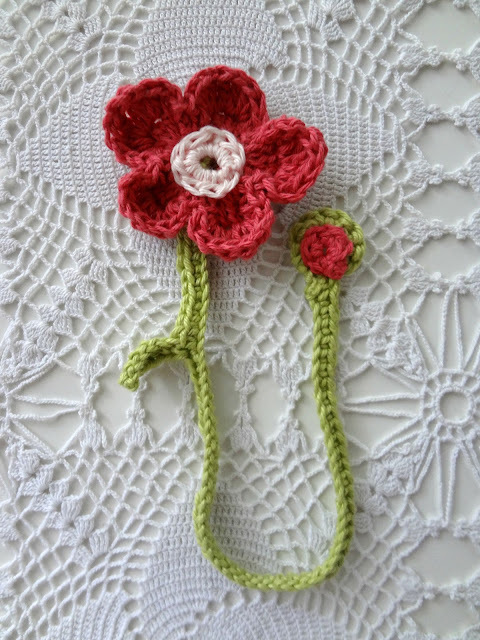 In the loop I inserted a "flower center" How do you make that? Ch 5 and join. Sc 5 or 6 in the ring and voila! Ch 7. Sl st in 2nd st from hook, next hdc1, dc1,dc1, hdc1, sc1. For the calla, ch 5 and make a ring. Rnd 1: In the ring, ch3 and dc5. Rnd 5: Turn work and sl st in the first 3 stitches. sc 1 in the next 2st, hdc1 in the next 2st, next dc2 in one st, dc1 in the next - repeat this 4 times, dc2 in one st again. Next, hdc1 in the next 2st, sc 1 in the next 2st, sl st in the remaining 3 st.
For the filament - ch 20, double the chain and put in center of calla. You will sew it together with the calla. Thread yarn and sew the sides of the calla sewing the filament too. Take green yarn and ch 5 through the calla's bottom, and join the stitches as you would for a ring. Next, chain a long chain (65). When at the bottom, ch 7 more for the leaf, crochet the leaf pattern and to make the other side just crochet in the reverse. 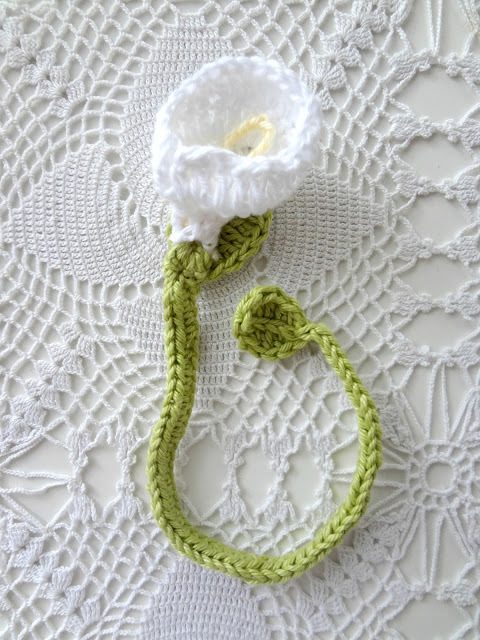 When done, insert the hook through the leaf, yarn over and sc on the top of the leaf. Continue making the stem by making hdcs in every st to the upper end. I made the big calla leaf separately and afterwards sewed it on. The pattern for it: Ch 12. Sl st in the 2nd st from hook, hdc1, dc1 in the next 2 st, tr2 in the next 2 st, dc1 in the next 2, hdc1, sc1, sl st 1. Repeat pattern in reverse to make a full leaf. The flower center as for the forget-me-not. Ch 5 and make a ring. Rnd 1: Sc5 in ring. Rnd 2: ch 3 and sc in the next st. Repeat this pattern around. there should be 5 ch spaces. Rnd 3: In the 1st ch space - sc1, dc3, sc1. Repeat this pattern for all spaces. Rnd 4: Ch4 and make 1 dc in between the two dcs of the petal, ch 4 more and make another dc in the same st, then ch 4 and sc between petals. Repeat this pattern for the rest of the petals. Sl st to end it. and made some French knots to decorate it. I love these pretty bookmarks you made Maya. These would make great gifts. 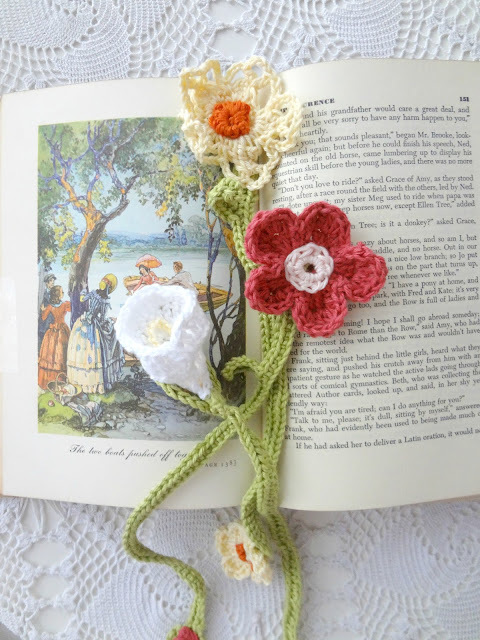 I would love to try and make the red flower bookmark. Thanks for the pattern. Everything you make is fantastic and I thank you so much for sharing!!! These are beautiful. I only have very basic crochet skills, but I would love to try these. Perfect gift for readers! Oh, that is so sweet of you Lynn! Thank you so much on the lovely, supportive comment. You are welcome - it's my pleasure! Thank you Pam. 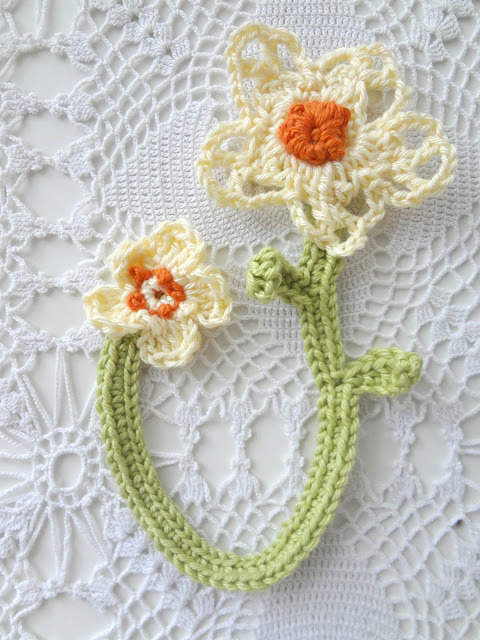 If you know the basic crochet stitches, you are well on your way. Hope you make some to cheer you! Maya, these are beautiful! Thank you for sharing. I love watching your work. Everything is well written, You describe it perfectly. I am waiting for more. Much obliged David! Thank you! Absolutely adorable bookmarks, Maya. Thank you for sharing the patterns. Kisses, my friend. I LOVE these and am featuring them! Thanks for sharing with us at the To Grandma's House we go link party! Awww ... that is so sweet Tarahlynn!! Thank you so much! These are beautiful! Saw them over on the To Grandma's House We Go link party! I love these! Can’t wait to start crocheting! Thank you Lora! I am glad you visited! Thank you! Hope you have fun! These flowers are lovely, Maya. 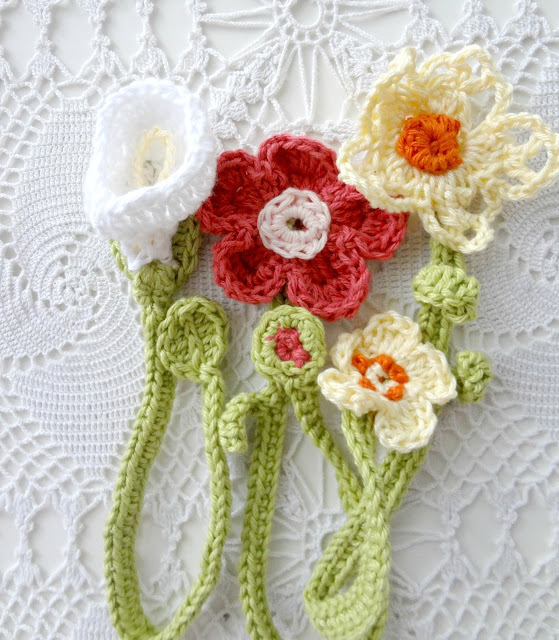 I can see these pretty blooms flourishing across a knitted or crocheted blanket. 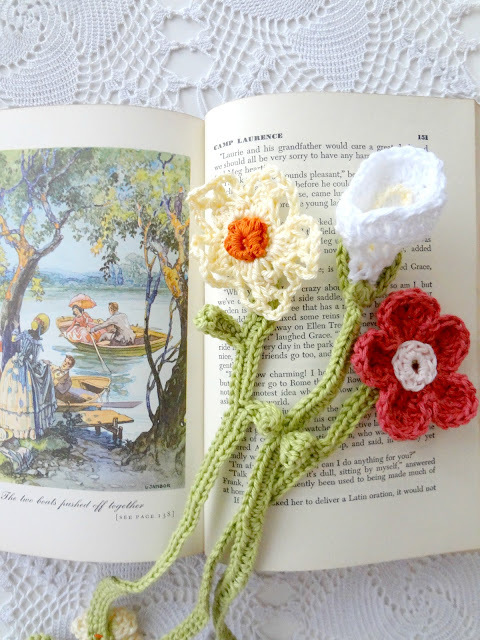 Gorgeous crochetproject, my dear! 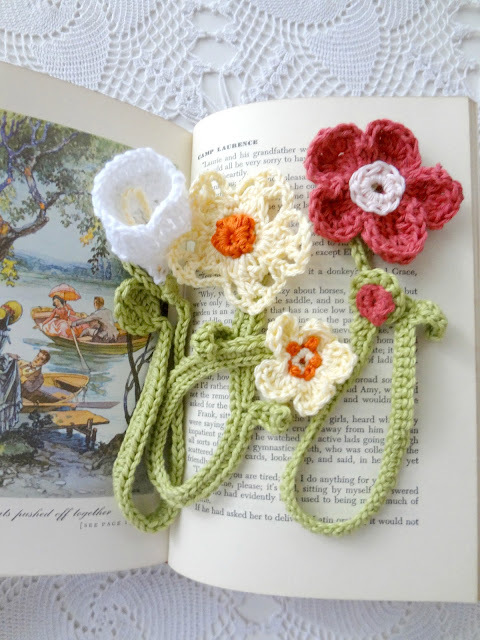 Your flower bookmarks look so sweet and lovely! Thank so much for sharing the pattern with all of us. This one is going to my "To Do List", that's for sure! And also I'd like to include this project (one picture plus link) in my next "Summer Round-Up post" that I'm going to publish in my blog today. Have a lovely Sunday, dear! I am so happy to hear that dear Anabelia! It gives me great pleasure to hear people love these simple cuties and I am very greatful for the feature! Thank you so much! These are lovely! Thank you for sharing with us. I have never seen such clever bookmark. Thank You! They are beautiful and the few people I know who still read hardcover will love them. I have never posted any remark before because I think that no one reads them anyway but I am so happy with this I had to comment. I have also not crocheted in many, many years-- my daughter is 59 so it has been 60! Yikes! Thank you that you have shared this because at 81 my income is extremely limited and I could not afford to buy it. Dear Kathleen, thank you on your lovely comment! I am happy you like it and widh that making these wil make your reading time more pleasurable. People do read commeents and I appreciate you taking the time to visit me and leave such a kind comment!